Curling Stones for Lego People: #HullBloggers go mad in Fudge! #HullBloggers go mad in Fudge! Normally you know what you're getting with Curling Stones, well actually you don't given my tendency to blog random jewellery at times, but you do know that you're getting jewellery... except when you're not, and today, is one of those not jewellery days. As a rather niche jewellery blogger, whose blogging focuses on modular jewellery systems of which 80-90% of coverage is given over to Trollbeads, I don't tend to do the rounds of Blogger Meets and networking opportunities - they are often beauty/lifestyle orientated, and as a non-make up wearing niche blogger there's sometimes much on the agenda that I have little interest in. Not that I don't have a "lifestyle" because that just covers anything you might happen to do in life, sort of... But as much as I might enjoy my day out meeting other bloggers and finding out about new things (I love learning about all kinds of stuff, yes, even make up which I don't use!) I think that often my place would be more beneficial to someone who's really into all that stuff and will give it due coverage if they like it. My Earl Grey matches the beauty products! #HullBloggers pretty much does what is says on the label, well apart from when it doesn't... your birth certificate is not checked at the door (good job or they definitely wouldn't have me) and there is no initiation ritual, or if there was I was running late for that one and missed out. I love that they are such an inclusive bunch, friendly and totally open to whoever wishes to come, regardless of what you blog about, or indeed how long you've been blogging. Like a lot of Hullcentric things this means that there's something for everyone, yes, even me! There have been 2 meets so far and this one took place at Fudge, a restaurant and bakery in the Princes Avenue area of Hull. Afternoon Tea at Fudge and another Earl Grey! #HullBloggers hired the 1st Floor Dining and Bar above Fudge Restaurant (the bakery is just next door) and we all pre-ordered an Afternoon Tea Party, served, er, during the afternoon! Ingeniously after a research trip (or three) to Fudge in the run up to this meet, the organisers decided to add a side of Fudge's own Handbaked Nachos - good choice! I'm getting a bit ahead of myself here, let's get this into a more orderly fashion... we actually talked back in late October about the possibility of meeting up again, and staggeringly, by early December I was actually setting off to meet up with everyone at a fully organised meet! Alex, Jenny and Jaye organised this event and the goody bags, raffles (yes there were two) and product support were amazing, and more importantly, were so varied that even this blogger has been overwhelmed with just how much of these I'm currently using, looking forward to using, have used and really enjoyed! Given the timeframe of how quickly they pulled all this together it was super impressive! The absolute first thing I reached for in my goody bag was my frame from Frame Again, it's the cardboard box at the front of the bag! Prior to the event we were invited to send a photograph to Jake at Frame Again - I was really excited by this as I'd had a look at the website and the idea really appealed to me. Now I'm a big user of the standard clip frame for many prints (harking back to my student days for cheapness and simplicity) and all the non-clip frames I own are fairly traditional and predominantly wood based. Anyone who knows me would be surprised by my enthusiasm for recycled plastic chunky frames, but we should all have the capacity to surprise others lest we get too predictable! I actually spent quite a lot of time choosing what to have framed, in the end I plumped for an old photograph taken in 2010 with my then phone and slightly enhanced using basic online software. I didn't get to choose the frame colours of electric pink and white but I'm absolutely stoked by how good this looks. It's easy to change the photo & the magnets will help you stack the frames! The frames all contain magnets so you can stack them side by side, on top, back to back or hang them traditionally on a wall (the place to hook them is built in, so the frame sits flat onto the wall). The nook for the hook! I work from home in my regular job and I have lots of photos on the walls that I've mostly taken myself. I like to choose photos that I can gaze at during the working day that make me happy so I plan to expand on my photo wall with some Frame Again again! However there was a LOT more to get through... The best thing about the day itself was catching up with everyone and their news, I was feeling a bit knackered as I'd been away during the week for work, and at the weekend for fun, and as I'd only just got back I was a bit quiet in my corner as I really needed a bit more sleep - it's an age thing, I can no longer burn the candle at both ends without a few extra naps built in, more like burning the candle in sensible bursts to save both setting fire to yourself and not becoming a puddle of wax... or something like that! there were a lot of milky fingers during this session as people tried out different "products"! During the afternoon we had demonstrations from Arbonne and Younique and about The Library of Fragrance - it was fun to see what what was out there as I confess that I pay little attention to these things in my everyday life. Arbonne and the Library of Fragrance smelt very nice & Younique demonstrated their 3D fibre lashes (the latest thing in mascara I'm told) which was interesting to watch, but as I don't wear it I used my time instead to catch up with a few folk whilst many of the girls had their lashes done! Arbonne testing & our 3 organisers demo The Library of Fragrance! There were 2 raffles held to raise money for Look Good Feel Better, a cancer charity which we were raising money for, and in between all of this there was lots of time to eat the yummy buffet! There were a LOT of raffle prizes! The first raffle was a single ticket raffle designed to ensure that everyone won a prize, I was lucky in that I won a prize I was hoping for, a package of 2 notebooks from Ohh Deer (quirky illustrated gifts) - I do love a good notebook! Ohh Deer Notebooks - great prize for me as I love stationary! The second raffle was drawn for some of the bigger prizes with no guaranteed wins... I did however win one! But I put it back into the draw for someone else to enjoy as it was a juice detox - which I didn't think I'd use, but even if I had been prepared to give it a go, it was due to start the day before my birthday... and I had definite un-detox-like plans for that day!!! What was really sweet was that one of the organisers was super lucky in the second raffle but kept putting the prizes back in as she felt it wasn't fair! The table I was sat on were quite lucky as a group and there were a few swaps going on as people were trading prizes so everyone was perfectly matched by the end of the session! It was soon time to head home and I sadly had to decline the post meet drinks as I had an early start the following morning for work, the photos I saw online later looked like everyone enjoyed themselves. Old El Paso Burrito Kit and my 2nd Goody Bag! Before leaving we were given a 2nd goodie bag and an Old El Paso kit so I looked like I'd been on a massive shopping spree as I emerged into the cold December air from a very warm and cozy Fudge! I really appreciated the sheer effort that everyone had gone to to provide products to try that were as varied as we were, I was delighted by the sheer amount of food contained within the bags!! I always said I'd work for tea and beads so it was no surprise to find some tea and other culinary delights!! When I got in the first thing to come out was my Frame Again picture, this is currently living on my bedside table and never fails to make me smile. I really do plan to get some more of these for my office. My first big surprise was actually the thing I thought I'd hate the most, instead turning out to be something I really loved! Peanut Hottie is a peanut butter based hot drink, I HATE peanut butter, I like peanuts but I'm not a hug fan... (oops typo, I'm a definite hug fan, just not a huge fan of peanuts) However I was determined to try everything so I delved in with a cup before bedtime - I figured I'd get the worst bit over with... it looked like milky tea when I made it, I gingerly took a sip... I loved it. I was gobsmacked. The biggest surprise of all! It's very sweet and you do need a good 4 heaped teaspoons to make a mug sized drink, but it's surprisingly lovely, especially surprising, if like me you hate peanut butter!! Now this is something I never would have picked up off the shelf if I saw it in my local supermarket, but now I've tried it I definitely want to try the Peanut Butter and Hot Chocolate version. I've also tried this out on my best friend and my other half and it's got a thumbs up from them too! I was typing this up last night and another victim, er, I mean visitor, was handed a Peanut Hottie drink... another thumbs up and there's going to be at least a few sold on this basis. Overall opinion tends to be it's very sweet, definitely a treat, like a good hot chocolate. I spotted the Kettle Crisps straight away, a big sharing bag of one of their "seasonal" flavours, they weren't hard to miss being such a big bag. I was already a fan of Kettle Crisps, but the flavour was a new one I hadn't tried before - Cheshire Cheddar, Red Wine and Cranberry. Really enjoyed these, quite rich in taste. I did end up sharing a bit, but mostly I kept eating these myself... I've been so lucky so far with flavours in my goody bag! American Chip Spice... from Hull! American Chip Spice... the formerly best kept secret from East Yorkshire! The packaging may have changed but we all know and refer to it as "y'know, chip spice, from Hull, for your chips!" I was so pleased to see these in my goody bag, and even managed to snaffle some extra... just in case we ran out. Another drink that was included in my goody bag was a can of Virtue Ice Tea Drink - again I've never been a major fan of Iced Tea but I did enjoy this, I saved some for my other half who is more of an Iced Tea drinker and it got another thumbs up. This is something I'd buy again if I saw it, it was quite refreshing and not like other iced teas I've tried. By the way the can is a bit "used" as we'd recycled it before I remembered I didn't have a photo! There was also cake from Enjoy Crumb - I got Rocky Road, 4 pieces, it was absolutely delicious and it was shared, although if I'd have tasted it first I may well have kept it all to myself! It was so good, this was all that was left to photograph! Enjoy Crumb do cakes through the letterbox and gift boxes for special occasions, so there are lots of other different types of cake available. Gift boxes often come with different teas or coffee and a variety of cakes, we tried some of these at the Blogger Meet and I also had some of the teas in my goody bag as well. I was now on a mission to at least find something I didn't like as this was becoming a bit one dimensional... tasty and lovely but I was wondering if I would find anything that I didn't like??? We all got an Old El Paso kit as we were leaving, mine was the Burrito Kit and I'd also got a jar of Salsa in my goody bag as well. I was originally going to save this for the bus as I'm always looking for food ideas that are nice and easy to do on board, and the dates were fine on the kit... however one Saturday we decided to crack this open at home. As anyone who is familiar with these kits knows you need to buy some basic ingredients, we choose mince, cheese, lettuce, fresh tomato and sour cream. 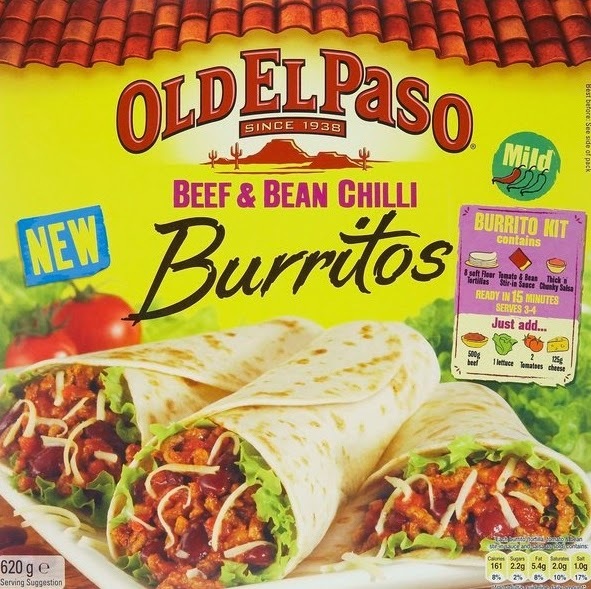 I enjoyed this kit although I personally prefer the Taco or Fajita kits, in fact the Fajita kit is a good one to use on the bus as it's so easy to make! Old El Paso Fajitas on the Bus! Moving on from the food there were a few beauty products that I've actually tried, the first one was Skinetica - amazing the difference a change of packaging makes. I'd had a sample of this previously in an opaque white plastic bottle but hadn't tried it - it now comes in a blue see through plastic bottle which somehow makes it more appealing?! I don't have acne nor wear make up so I'm not really the target audience, however it can be used simply as a toner which is how I've been using it for the last couple of weeks. It works fine as a toner, doesn't leave my skin too dry after use and I'm quite happy with it. Would I buy another bottle, possibly not at the price given I have good skin anyway but I am going to pass the other unused bottle onto someone else to try. I really like it as a toner but I'm curious to see if it will help someone who does have problem skin. There was a Paul Mitchell Dry Shampoo - I've never used a dry shampoo before so I have nothing to compare it to... I also didn't think I'd use this. However we had a bonfire mid-December and my hair absolutely stank of smoke and I didn't have time to wash it. Remembering I had this I applied liberally according to the instructions and brushed it through - amazingly no smoke smell, no sticky residue and no white powder. I have quite dry dark hair that has a natural curl so I don't wash it very often anyway; I will definitely keep this for emergencies! There were quite a few mini-samples and I'm going to work my way through these, although the Lypsyl has gone straight in my bag! Love that stuff!! Tea, the natural bloggers fuel... I know I like Yorkshire Gold and the Taylors Tea already having tried these before. As these are all individually wrapped I will take them to work with me on visits, so I know I'm never short of a tea bag when I need one! A purse from Missco Girl, a present from Tessies and a fabulous sausage dog roll of tape from Ohh Deer! In addition to all these, there were lots and lots of discount codes and cards! My favourite so far has been a voucher for Personal Planner - this was very generous and more than enough to try out their biggest planner. I spent ages deliberating what to get, I love stationary, diaries and planners but I also end up using my computer and phone, especially for work so I wanted to try and make something that I'd actually use all year long. I thought about what I could fit in my handbag (which is not Tardis like) and I opted for a slightly smaller square planner and another notebook... I put my order in late, just before Christmas so I'm waiting for these to arrive. The process of choosing on the website was fairly straightforward, the hardest part was choosing what I wanted. If I get good use out of these in 2015, I can see me ordering a repeat for next year, especially to keep track of all my New Year's Beads Resolutions and blogging info. I still have quite a lot of the vouchers to go through but phew! If I were to put in all of what was in the bag then you would grow very old reading this (well done if you've made it this far!) or perhaps you have already fallen asleep? I've tried to include things I've tried and really enjoyed, or things I'm really looking forward to trying. Care to swap any tales or first impressions?? Karma Beads ~ Budget, what budget?! Winter Snow Bracelet ~ Hurrah it's December!